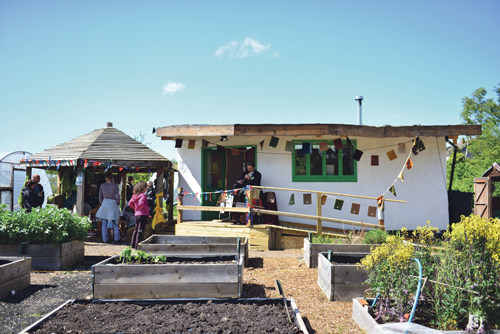 Golden Hill Community Gardens have had yet another fantastic, community focused year. 2016 has seen the creation of an outdoor after school club for children in the area. The Golden Club runs every Tuesday from 3.30-5.45pm. This expands the plentiful child-focused activities seen at the garden with the outdoor school holiday Adventure Days, and the Golden Buds Toddler Group. During the Summer holidays the Garden created inclusive Family Days with support from BCR Neighbourhood Partnership wellbeing fund. In conjunction with 'SEND a welcome' these days were for children with special educational needs or disabilities to enjoy with their family and siblings and other families in the local area. The Spring and Harvest Fairs were a huge success this year and helped raise funds to support the community projects in the Garden. The sun shone for both events and welcomed hundreds of visitors for a plant sale, traditional fair games, live music, storytelling and a gnome trail! This year the garden will aim to make their events even more accessible to families who have a child with special educational needs or a disability. The year ended with a lovely crowd celebrating Bonfire Night and a festive flourish in December with a stall at the Gloucester Road Street Party and a drop in Wreath Making workshop. Lucy Mitchell, garden coordinator said: "Thank you once again to our fantastic volunteers, none of this would have been possible without them. We are always keen to welcome new volunteers to sow, grow and share the harvest, so please join us in the garden in 2017!"